Open, Scan, Recovery & View any size of Exchange EDB file. Preview all items of EDB file like Emails, Calendar, Task, etc. View EDB file emails with associated attachments & attributes. Recover corrupted EDB file with Advance & Quick scan mode. Scan & Recover both; Private and Public folder EDB file data. Process database without Exchange Server environment. The EDB database viewer allows you to view single or multiple EDB files. By using "Add File" option you can add and scan multiple EDB files one by one and instantly view data of all files. The EDB Viewer loads all the mailboxes present in an EDB file and generates a preview of all items of all mailboxes. You can instantly preview all the items within a mailbox like Email, Calendar, Contacts, tasks etc. You can open and view all emails with their associated attachments. The Normal Mail View will show you the Header and Body of the email and the Attachment view will show you the attachments associated with selected email. The EDB Viewer generates instant preview of all items with attributes. You can view the details of email like From, Subject, Date, Cc, Attachments, etc and in case of contacts the software will show you the details like email address, last name, etc. The EDB Viewer provides two options to scan a corrupted EDB file. You can select Quick Scan for minor corruption and Advance Scan for severely corrupted EDB files. After scanning, you can easily view your corrupted or inaccessible EDB files. The Free EDB viewer supports dual file recovery mode. The software scans both priv.edb file and pub.edb files of MS Exchange Server and recovers Exchange Server Public store database and Private store database. 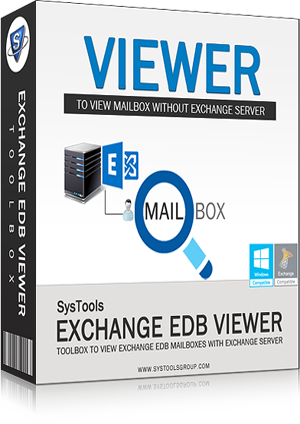 Can I recover my corrupted EDB files with Exchange 2010 mailbox Viewer? Yes, you can easily recover and view your corrupted EDB file by using the EDB viewer. You need to select Quick Scan mode for minor corruption and Advance Scan for severely corrupted EDB files. •	I want to convert my EDB as a PDF. Is the conversion supported? The Free Exchange EDB viewer does not support conversion. However, you can use Exchange EDB Viewer Pro to convert your EDB files to PDF. Can I view my EDB data without Exchange Server? Yes, the Software doesn't require Exchange Server Environment. So you can view the data of your EDB file even if your machine is not connected with Exchange Server. What are the System requirements to run Exchange 2003 mailbox Viewer? The Free Exchange EDB viewer supports Windows 8.1 and all below versions of Windows.1 GHz processor, 512 MB of RAM and 512 MB of free Hard Disk space is required to run the software. "The Exchange 2007 mailbox viewer is a great tool. I like the scan options provided by the software because I am able to view my inaccessible EDB file with the help of it. Thanks to the entire team." "I am not a technical person. So, I like the software for its user friendly graphical interface. By using this software, i was able to view the data of EDB file without Exchange Server environment very easily. For a non-technical person like me it seemed impossible." "EDB Viewer allows the users to view the small sized as well as large sized EDB files without any data loss. I have used the software and recommend the same for viewing the data of large size EDB file."